The Minger 16.4Ft LED Strip Light is pretty awesome if you use it only as a regular old LED light strip. Just like the pricey $90 Philips Hue LightStrip Plus, it’s easy to install anywhere to add a gorgeous glow in spaces where no normal bulb can ever hope to reach. But the Minger model has a very cool extra feature that you don’t often find on LED light strips. Thanks to the built-in mic, you can set it to flash in sync with your music! Use the coupon code 2HST7IF3 at checkout and its yours for just $13.99 instead of $25. 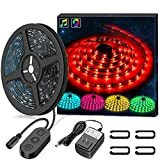 ➤Multi applictions : MINGERE RGB LED light strip can be used for decorating your dining room, bed room, upstairs, kitchen, porch, desk, and living rooms, especially great for holidays and events like Christmas, Halloween,Parties, and more. It is a great gift for your family and friends. ➤Flexible control : Portable controller smart controller included, simple to turn on/off by one press on the button, more colors and brightness be controlled by one controller ,convenient and concise. ➤Safe & easy installation: LED light strip has a working voltage of 12V and are equipped with short circuit protection and memory function. IP65 waterproof, extremely low-heat, touchable and safety for children.The lights tape on the back come with an strong adhesive, easy installation. ➤Reliable after-sales service : MINGER offer high quality and diverse products, including waterproof, non-waterproof, various lengths led strip lights and accessories. Our friendly and reliable customer service will offer any help about your project.